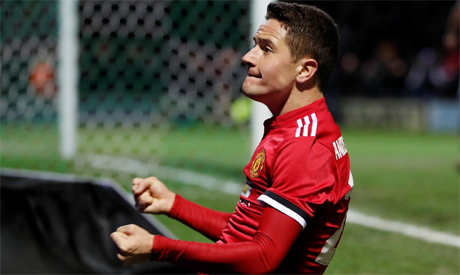 Manchester United midfielder Ander Herrera believes the team have shown they can thrive as underdogs and will look to secure another statement win in Sunday’s derby. Jose Mourinho’s United will make the short trip to face the Premier League leaders Manchester City as they look to build on a 2-1 comeback victory over the Italian champions Juventus in the Champions League on Wednesday. The victory in Turin added to a four-game unbeaten run in the domestic league, with United climbing up the standings after a wretched start to the campaign. “When you win, you are more optimistic in your preparations for the next game,” Herrera told the British media. “We are the real Manchester United, also in the bad moments, because we have to recognise we have bad moments and have to improve. United roared back from two goals down to beat Pep Guardiola’s City in this fixture last season to delay their neighbour’s coronation as Premier League champions, but Herrera said recent history counted for nothing. Seventh-placed United are nine points behind City, who are unbeaten this season on 29 points from 11 matches.